We huddled around the coffin, tears streaming down our faces, my little family of six all mourning the death of Charlotte. Everyone remembered the day we first met her. We tried to recall her funny habits. Some of us attempted to share stories about the times she made us smile. Charlotte had been the love of my seven-year-old son Toby’s young heart and the apple of his eye. But, no, she wasn’t a friend or a relative or a next-door neighbor. Charlotte was a hamster. She was the one and only gift Toby begged for in honor of his kindergarten graduation. As soon as he saw her fluffy peach and white face in the pet store window, he knew she would be his. He cared for her tenderly, checked her food and water several times a day, and took her out to hold her and play with her. And he cleaned her cage faithfully each weekend. But even with such faithful care, somehow, over the summer, Charlotte developed a cold. First we noticed that she didn’t come out of her Mr. Potato Head house much anymore. Then one day we heard her sniffling and sneezing. By the time we brought her to a vet, the cold had turned into pneumonia. Her lungs filled up with fluid, her sighs became ragged, her peachy chest heaved. The day we finally lost her she was struggling for every breath. I’ve never seen Toby more heartbroken about anyone or anything in all his young life. My husband built a little box for her, and we placed her under the apple tree with a large stone marking her resting place. The day of Charlotte’s funeral brought more than sadness into our little home. It also brought questions and concerns, like, Where do we go when we die? Are people in heaven watching us now? And what happens to animals when they die? For the first time, I watched as my children wrestled with the age-old question: What comes after this life? Fast forward a couple of months. Again we huddled around a coffin, tears streaming down our faces. But this time we weren’t mourning the death of a pet. This time we were here because a mommy in our church had given birth to a baby who was already dead. This tragedy was senseless. It left us feeling hollow inside. How we had waited for the arrival of this special new life! But the arrival never came. And this funeral felt so different from Charlotte’s little funeral just a few months ago, because we couldn’t do any of the normal things. We didn’t have a day to remember when we first met this baby boy. We weren’t able to become acquainted with any of his funny habits. And nobody could share any stories about the times he made us smile, because we’d never truly known him. “This feels unfair. Why did Jesus let him die, Mommy? Why do any of us have to die?” Toby whispered my own thoughts beside that strikingly small, little coffin. We had more happy things to say about a hamster than we did about this poor little baby. And there they were all over again: the age-old questions, the existential dilemmas life forces us to face at such fragile, young ages. Do these questions have any good answers? And if so, would answers ever even be enough for hurting hearts? Whether 7 years old or 70, most people admit to feeling afraid of death. Because it’s an unknown, because it seems to be mere speculation and guesswork, many don’t believe we can know for certain what happens after this life. Maybe we’ll fly up to heaven? Maybe we’ll morph into another life-form? Maybe we’ll become part of the universe? Or maybe we’ll merely cease to exist altogether? All we know for certain is that death eventually comes to everyone. But is there more we can know for certain? Yes there is. The Bible is very explicit about both life and death and has lots of good news for those of us who have questions about death. Life in the Bible. In order to fully understand what the Bible says about death we have to understand what it says about life. Let’s begin with a little math. Try not to groan. It’s biblical math. We need to understand how God created us. Genesis 2:7 says, “The Lord God formed man of the dust of the ground, and breathed into his nostrils the breath of life; and man became a living soul” (Genesis 2:7, KJV). Did you catch the equation? Dust + God’s breath = a living soul. Most people think of the soul as a conscious entity that survives the death of the body. But Genesis 2:7 is telling us that we don’t have a soul; we are a soul. When our dust-formed bodies received God’s breath, these two things combined formed a living soul. Now you may say, “There you have it! The “spirit” (or “soul”) returns to God who gave it. In other words, our body dies, but our soul continues a conscious existence. Not really. Let’s take a short detour into the Hebrew language. The Hebrew word for “spirit” in Ecclesiastes 12:7 is ruach (the letters ch are pronounced like a guttural g), and it’s translated several ways in our English Bibles. In the King James Version it’s translated “breath” 27 times “wind” 92 times, and “spirit” 232 times—plus other ways that don’t concern us here. So how should we understand the meaning of ruach in Ecclesiastes 12:7? The answer becomes obvious when we compare it with Genesis 2:7, which says that when God created Adam He “breathed into his nostrils the breath of life” (emphasis added). Ecclesiastes 12:7 is simply telling us that when we humans die, God reverses the process. He takes back to Himself the “breath of life” that He gave us humans when we were born. Ecclesiastes 12:7 is the reversal of Genesis 2:7. 1. They don’t know anything. 2. They have no more love. 3. They have no more hate. 4. They have no more jealousy. 5. They can never again take part in anything that happens under the sun. The conclusion is obvious: dead people have no awareness, no consciousness. “His disciples replied, ‘Lord, if he sleeps, he will get better.’ Jesus had been speaking of his death, but his disciples thought he meant natural sleep. 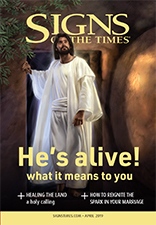 “So then He told them plainly, ‘Lazarus is dead’ ” (John 11:11–14). This idea of sleep fits in perfectly with what the Bible has already taught us: that dead people don’t know anything, feel anything, or participate in anything any longer. This reminds me a bit of the way my oldest son Caleb sleeps. Once he’s really asleep, it doesn’t matter if I stomp around in his room, flip on all the lights, vacuum, sing, or even shake his bed—Caleb will not wake up. He’s completely unaware of anything happening around him. This is exactly what it’s like for us to be dead: we’re soundly asleep, peaceful in our ignorance of all that’s taking place around us. Last year I lost my 89-year-old Grandma Shirley. Of all the losses I’ve endured so far in my life, this one ached the most acutely. Grandma and I had been very close. She was a real friend, a savvy shopper, a hilarious storyteller, an invested listener, and a wonderful grandmother. After she died, her absence in my world felt so final. It might have brought me comfort to think that she was looking down on me from heaven, that she could still see me and somehow send messages to me or that she could still enjoy the wonderful things that happen to my family. Most Christians in the world take comfort from believing just that. They believe their loved ones are safe in a better place and can look down on them with joy. But while this thought may be comforting to us who are still alive on planet Earth, I don’t think it would be very comforting to Grandma. How would she feel on the days when she had to see us sick and suffering? How might she feel having to watch one of us die? How would she deal with the possibility that, one by one, people on earth were forgetting about her? This doesn’t sound very much like heaven to me. I like Jesus’ description of death a whole lot more, and I find considerably greater comfort in it as well: to think that Grandma is sleeping peacefully until Jesus comes again. To be honest, though, I don’t think these logical answers can ease the pain we experience when a loved one dies. When I’m standing at a graveside missing my loved one, heart pummeled by the grief and sadness, I’m not thinking about the equation of a living soul. I’m not thinking of the list of all the things dead people can’t do, and I’m not even thinking about the reassurance from Jesus that they’re sound asleep. What actually brings me hope at times like those? The best-news verse of all, which I have saved for the last. The apostle Paul assures us that “the Lord himself will come down from heaven, with a loud command, with the voice of the archangel and with the trumpet call of God, and the dead in Christ will rise first. After that, we who are still alive and are left will be caught up together with them in the clouds to meet the Lord in the air. And so we will be with the Lord forever. Therefore encourage one another with these words” (1 Thessalonians. 4:16–18; emphasis added). This is the real end of the story—the end of all our stories for those of us who believe in Jesus and have accepted His gift of eternal life. We sleep for a little while, but soon Jesus’ trumpet sounds at His second coming, we awake to spend eternity with Him. This is true comfort, this is safe salve for my sorrowful heart. Because I know that death is not the end, a funeral doesn’t have to be the last goodbye. I’m still not sure if hamsters go to heaven, and I wish I had better words for why innocent babies sometimes die, but one thing I know for sure: the story doesn’t end with a coffin or a grave. The story ends with freedom, triumph, and a victorious Lord Jesus coming in the clouds to take us home. How right it is that we can comfort each other with these words.